The mobile platformer Oddmar reached us almost out of nowhere. We have looked at the action platformer and will tell you in the following review whether a purchase of the bouncer is worthwhile. RATING PENDING - Not yet assigned a final ESRB rating. Appears only in advertising, marketing and promotional materials related to a physical (e.g., boxed) video game that is expected to carry an ESRB rating, and should be replaced by a game's rating once it has been assigned. The title-giving hero is anything but a hero to his Viking tribe’s roommates. He is too afraid to belong to you, so hardly anyone else thinks it is necessary to deal with him. Only his friend Vaskr seemed just as good-natured, but mysteriously left Oddmar and followed the call of the forest. Sometime later, however, events rush as a strange fairy visits Oddmar’s dreams and gives me superpowers overnight. As if that wasn’t enough, all the villagers suddenly disappear. For once determined, our Oddmar takes a heart and follows the call of the forest in search of his ancestor and above all friend Vaskr. The story is told well, by platformer standards, and is continuously pushed forward in the cutscenes. 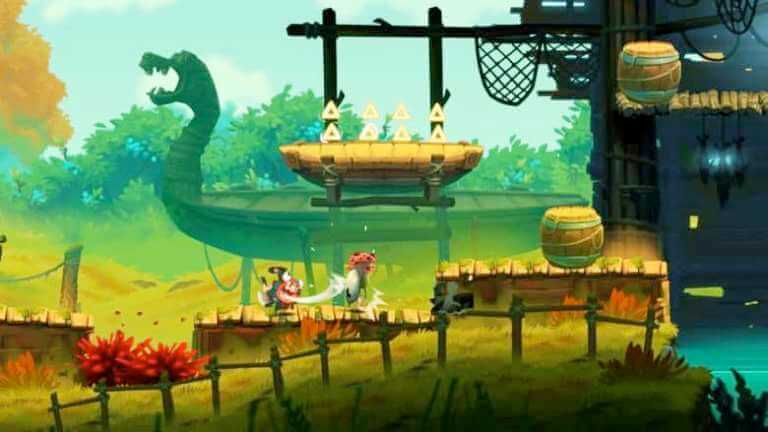 Oddmar even shows that a jump ‘n’ run can build on an entertaining story. At its core, Oddmar remains a jump’n’run and fortunately lets the muscles play true to the gameplay. Playfully, the latest iPhone game from MobGe is a dream, a pleasure – yes – even pure excellence. It plays incredibly fluently and catchy, which is also due to the excellent service. 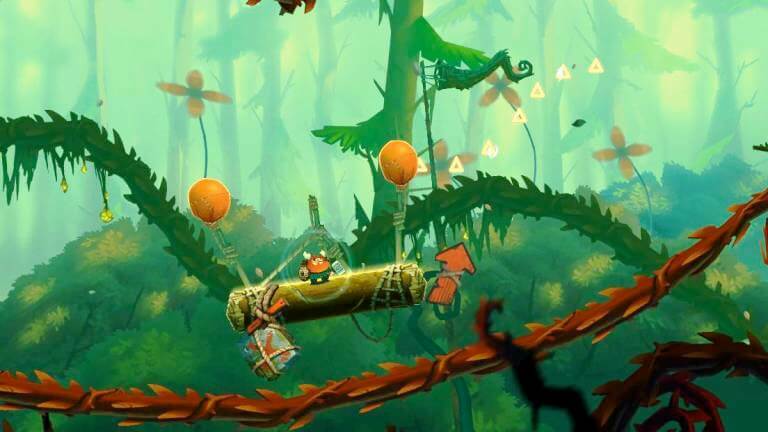 With a sliding pad, we move Oddmar through the colorful levels and hit the ball with pressure. A wipe upwards causes a fungus to emerge, which initiates the jump execution. In the beginning, this pictorial background is still a little unusual, but later it is hardly noticeable anymore. On your way from left to right, collect little golden triangles along the way. You can trade them for funny gimmicks in the occasionally hidden shops in the levels. The fact that Oddmar is, if only at the lower end of the difficulty curve, is the only disturbing hair in the soup. Everything else is pure joy. The level design is also incredibly funny and creative. Sometimes we take a ride on a wild boar, another time we have to protect ourselves in an elevator from invading enemies. At this point, we will not reveal more details, as spoilers considerably weaken the game experience. So much should be said: We were surprised several times why Oddmar does not also appear on the switch, it would certainly inspire the masses. Likewise, more content would also have had the potential to become GOTY on the game consoles. So our journey ends with Oddmar after a few hours of play, that’s all you need to complete the twenty or so levels. It doesn’t depend on the years of life, but on being in the years. Perfection, we can’t say less, is achieved in the presentation. Oddmar looks fabulous. The game world design of Oddmar is colorful, detailed and harmonious. Our favorite The forest scenery. 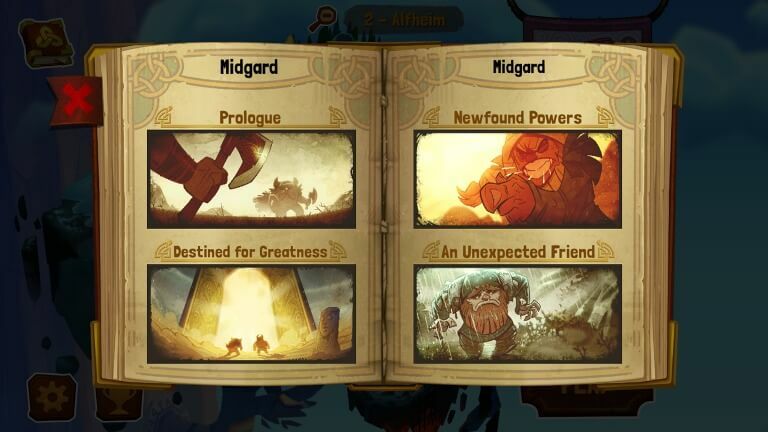 Also of excellent quality are the cutscenes that drive the story forward. The ingenious off-speaker, who does his thing wonderfully also contributes to this. The soundtrack in the levels is very cautious. Here the developers focus mostly on the ambient noise. If you own an iPhone and like to play games on it, then you owe it to your favorite hobby that you buy this pearl. For less than a Starbucks drink, this is an exceptional product that will entertain every second of your game. We are full of praise and can’t wait for the developers to provide us with more content of this kind. Great entertainment for all iPhone and iPad devices. If you own an iOS smartphone or tablet, you must buy this game for 5$. Not much. And yet, great fun.